This is a phenomenal Bluegill taxidermy fish mount, mounted to a natural piece of driftwood and facing to the viewers left. This beautiful fish measures 8.5" in length, 9.5" in girth, and has an estimated live weight of .5 lb. The fins are in outstanding shape and the painting is stunning. 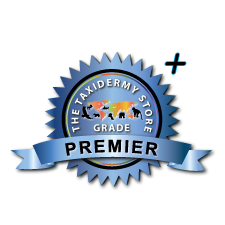 All of this combined with the terrific taxidermy craftsmanship has helped this item earn our Premier Plus™ overall quality rating. All applicable dimensions are included to help ensure this item will fit within your intended display space.